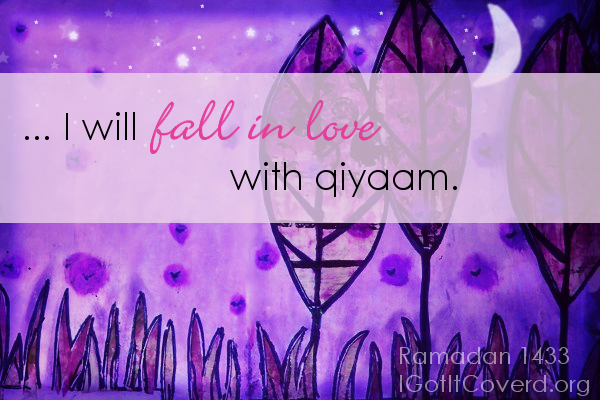 This Ramadan… I will fall in love with qiyam. Maybe you’re a homeschooling mother of four. Between the kid’s studies and the chores, between running errands and the distraction of phone calls, the concept of “alone time” is all but obsolete. Or maybe you’re a student, young and mostly carefree, but you’re trying to find your way through life. You’ve managed to make friends at school; you fit in now with your peers, but something feels missing, and you no longer feel as connected to Allah as you used to. A nagging question of “Why don’t I feel happy? Who am I, really, and what should I be doing with my life?” haunts you. Or else you’re a nurse who works 12-hour shifts. You selflessly look after others, and even when the day has felt particularly long (the patients did nothing but complain, and one of the doctors got snappy with you), you don’t have time to pause. You come home daily to aging parents who also need your care and attention. So often, we find ourselves stuck in a rut. We keep going in circles, from one responsibility to the next, without any sense of relief. It’s just the same thing, over and over, and we’re trapped by life’s daily grind. If only we knew the treasures the night can hold: The peace and silence; the calm and tranquility not found during the day. Lights out, family and children asleep, a phone line which might as well be dead. If only we recognized the night as our chance to talk – uninterrupted – with our Lord. If only we understood it as our chance to draw closer to Allah. To know that He descends, subhanahu wa ta’ala, every night in the last third of the night to the nearest heaven, in a way befitting His Might and Majesty. * O you wrapped up in your garment: * Stand (to pray) all night, except for a little. * Half of it, or a little less than that, * Or a little more, and recite the Qur’an with a slow, measured recitation. * Certainly, we’ll be sending down a heavy word to you. * Certainly, the hours of the night make a deeper impression and are more suitable for understanding the words (of Allah). * Certainly, you’re preoccupied for long hours during the day. * And remember the Name of your Lord and devote yourself to Him with complete devotion. Even our beloved Messenger faced difficulties. And this was Allah’s way of telling him that he should stand up to pray at night; that when he did, Allah would give him the strength to carry on during the day, salla Allahu alayhi wasallam. So whatever difficult times and long days we’re facing, when our beds and the thought of rest calls out to us, we should remember not to forget to make qiyam, to put in an effort to stand up before Allah and pray. Extra night prayers should be what we turn to: they should be our source of strength and comfort. Alhamdulillah, it’s easy to taste the sweetness of night prayer during Ramadan. We stand behind the Imam for long rak’ahs listening to the beautiful recitation, and we’re able to join in and reflect on the du’aa during witr. But qiyam should be something we strive for year-round. And in order to turn it into a habit, we need to fall in love with qiyam. Maybe that’s too high of a goal as of yet. Falling in love with something isn’t as easy as we think. Falling in love requires a lot of commitment and sacrifice. Falling in love means that we’re ready to give up anything for what we love. It means that we’re ready to do anything we can in order to get it, that we’re ready to sacrifice other very dear and important things for it, that we’re ready to prove our claim true by racing to achieve it. Yes, maybe that is a bit too much. But if we don’t strive for this level, then how do we truly value the blessings, those acts of worship Allah subhanahu wa ta’ala has gifted us with throughout the year, and especially during Ramadan? We can’t attain anything we truly value until we become willing to sacrifice for it. That mental rest from the long day’s toil; those most beautiful moments spent in seclusion with Allah; that sense of understanding and peace that can only come from being connected with our Creator and Maker – how will we achieve any of that if we’re not willing to sacrifice for it? How will we be given Allah’s love, how will we earn His nearness, how will we enjoy the sweetness of worshiping Him, subhanahu wa ta’ala, unless we give up our sleep, our laziness, our late-night surfing? Instead of clicking on just one more useless YouTube video to laugh, instead of checking Twitter just one more time for updates, instead of having that last slice of cake which will taste delicious but make us sleepy… why not give it all up to prepare to stand before Allah ta’ala at night and pray? Think of how righteous you and I can become, if only we would get up to pray at night. Think of how close to Allah we can grow, if only we’d put a little effort in. We want to become righteous people. We want Allah’s love and His nearness, His mercy and forgiveness. We went to go through life’s difficulties with strength and vigor, knowing that what we do is only for Allah… so let’s prove that we want all this by sacrificing and struggling to stand before Allah. This Ramadan, let’s fall in love with qiyam. — If you’re praying tawareeh (which is a form of qiyam), make sure to complete the whole taraweeh prayer with the Imam and end when he ends. — If you missed out on taraweeh, wake up a little early for suhoor to pray. For sisters who can’t pray, still wake up a little early to make istighfar, and insha’Allah Allah will reward you for praying qiyam consistently. — Make qiyam an occasion where you dress your best, preparing to meet Allah. — Make du’aa during qiyam in Ramadan that Allah will continue to bless you with being to stand before Him throughout Ramadan, and beyond for the rest of the year. Keep it up Oh daughter of AbdelHumaid. May I recommend that you re-publish the acclaimed and well received “I wore my best hijab today” article that you had published three Ramadans ago in anticipation of Laylatul Qadr? It is as opportune a time as any. I hadn’t really thought about republishing that article; I’d forgotten there was even a reference in it to Laylatul Qadr. We’ll republish it within the next few days, insha’Allah, so thank you for the suggestion. May Allah reward you abundantly.